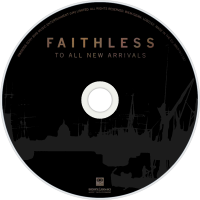 To All New Arrivals is the 5th studio album by dance music act Faithless. The album was created after the positive response to the Faithless Greatest Hits tour, originally described as their "final tour". The album was released on 27 November 2006, a week after the single Bombs. The title for the album was inspired by the recent birth of two babies to band members Rollo and Sister Bliss. Lead singer Maxi Jazz loved the title, partly due to his Buddhist faith and partly due to his parents being new arrivals to the UK in the 1950s. In one notable collaboration, the track "Spiders, Crocodiles & Kryptonite" features the vocals of Robert Smith of post-punk group The Cure. The song also contains samples and a section of arrangement from The Cure hit "Lullaby". The album was supported by a tour of all of the United Kingdom's major arenas which began in Nottingham on 17 March 2007. It entered the UK album chart at #30 for the week ending 3 December 2006. Given that their previous studio album, No Roots, entered the charts at #1, this position was seen as a disappointment. Unlike the original versions of Faithless' previous studio albums, initially this album was not released in the United States. However, a "Deluxe Version" appeared on the U.S. iTunes Store on November 4, 2007. The album cover features the 1880 oil painting, Nightfall on the Thames, by John Atkinson Grimshaw. The title of Faithless’ fifth studio album, To All New Arrivals, is derived from the happy fact that both Rollo and Sister Bliss have recently brought new babies into the world. Rather than allowing their new parental high to seep naturally through the pores of their new productions however, they’ve opted to use it as a hook for the entire album. Lead single “Bombs” kicks things off impressively; the chugging, chiming, understated beat, whispered social analysis from Maxi Jazz, and striking video making it classic music-with-a-message Faithless . From there though things get increasingly bogged down in the bathetic soup of ‘new parent’ syndrome. “Spiders, Crocodiles and Kryptonite” has someone uttering childish inanities over a quasi-eerie soundtrack; the record is saved by an extended segment of The Cure’s “Lullaby”, but only just. “Music Matters” (with Cass Fox), an otherwise decent, uplifting piece, is similarly marred by embarrassingly mawkish lyrics that give praise to ‘all those who stood up and counted / all those for whom money was no motive,’ etc. And it gets worse. “I Hope” is made up of trite messages of parental hope (‘I hope you don’t die before your time / I hope you always brush your teeth’), while the title track lazily plots child-death statistics over a plodding beat and throws in a chorus that chirps: ‘We’d die for you / kill for you’. So much for being anti-violence. Mixed messages and vacuous consciousness-raising aside, the music is also sub-par. Aside from “Bombs”, none of the tracks during the first half of the album inspire, with the droopy “Last This Day” (with Dido) and the nondescript “Nate’s Tune” being particularly wishy-washy. The album finally snaps out of this languid mood towards the end, with the robust “Hope & Glory”, the genuinely wonderful “A Kind Of Peace” (with Cat Power) and the head-bopping “The Man In You”; even the instrumental finale “Emergency” bristles with a welcome energy. But there are no “Insomnia”s, no “We Come I”s, and no real sign of Faithless’ former glory, so forcefully represented on their recent Forever Faithless collection. Well-meaning it may be, but To All New Arrivals is far from vintage Faithless.